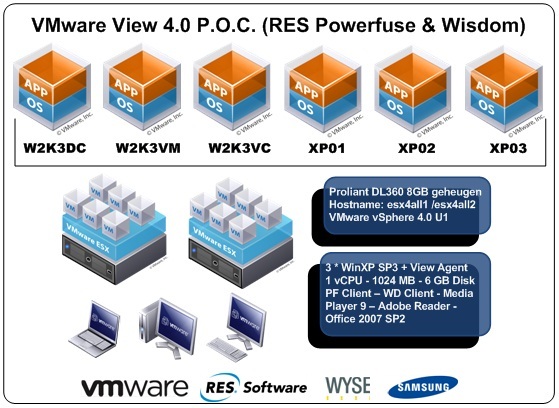 Last we had the opportunity to set up a VMware View Proof of Concept based on the new version 4.0. We grabbed some hardware set it up in our Support Lab. Installed vSphere 4.0 Update 1 on it. Prepared three virtual servers setup a domain with a domain controller, a vCenter server and a View 4.0 Manager server. We prepared the XP Sp3 golden image we planned to use and setup a Windows XP Sp3 laptop we planned to use as a View 4.0 End Point. From this point we started the VMware View installation. The installation is pretty straight forward and even me as a pre-sales consultant was able to do the trick. I was lucky to have some help from our engineers. 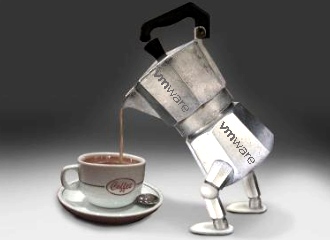 One of them just passed the vSphere 4.0 exam and another one had some experience with VMware View 3.0. Everything worked well and with 90 minutes we had our first vDesktop up and running and a laptop connecting to it. To get the View 4.0 up and running the first Windows XP virtual desktop is really a piece of cake. We had is done in about 90 minutes. 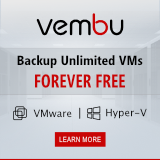 The easy to install and configure claim from VMware is true !! The way it plays a Full HD movie over PCoIP is really wonderful. Flash movies are oke when viewed in a small window, as soon as you play them full screen performance is not acceptable. We even tried to play a DVD movie from a local attached USB drive into the PCoIP session. Something to don’t want to do in a real production scenario but the result was really surprising. We also noted that during the playback of the HD movie the processor on the server had a hard time keep up with the rendering. I wonder how this will go when we install a fast video card with PCoIP support? Deploy Desktops with linked clones and see how RES Powerfuse en Wisdom will react on that. Install RES Wisdom, Anti-virus, Adobe Acrobat and some CAD viewers. Play around with the Flash optimization settings in View 4.0. Connect with the new Samsung en Wyse PCoIP end point thin clients. Limit the bandwidth and see how well PCoIP is doing at WAN speeds.